Mink generally are solitary animals, with males and females associating only during the late winter breeding season. Female mink are sexually mature at one year of age. Pregnant female mink may establish den sites in cavities of tree roots, rock piles, brush piles and log jams or beaver lodges. Research in North America shows that the most widely used den sites are bank burrows of other animals, particularly muskrats. Following a gestation period of about 51 days, the female gives birth to 1-8 young (4 average). Mink kits are born between April and June. Their eyes are closed, they are hairless, and they weigh about 1/4 ounce at birth. They develop rapidly and can eat meat within 5 weeks. Female mink reach their adult weight by the fall of their first year. Mink are primarily nocturnal with most activity spent feeding. Their list of prey species is varied. Food items include small mammals, fish, birds and amphibians. 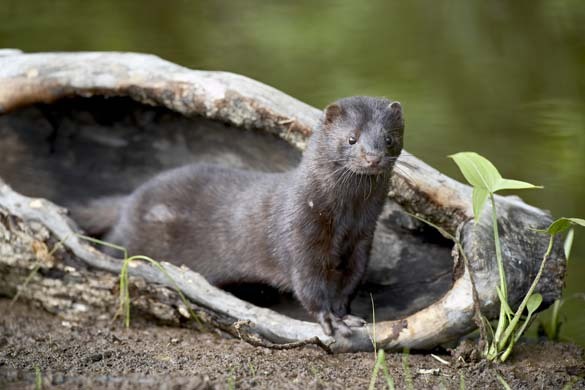 Mammals such as muskrats, rabbits and small rodents lead the list as the most important food for mink. Waterfowl, small marsh-nesting birds, and crayfish also are important summer foods, while fish are a common food item of mink during the winter months. Mink are very active and curious creatures. Their presence is seen easily along streams and creeks the day after a light snow. Their characteristic loping gait leaves double print or paired tracks. Tracks often show how they travel from one stream bank to the other, investigating nearly every hole, crack, crevice and overhang that may hide a potential meal. Mink are equally at home in water or on land. It often is possible to find areas along a stream where they have come up through a hole in the ice to begin their foraging activities along the stream.